Bring a large pot of salted water to boil. Meanwhile, in a medium sauté pan, cook the bacon for five minutes. Add the diced Pancetta and cook an additional 3 minutes. When the water comes to a boil, prepare the Fusilli pasta as package directs. Reserve one cup of pasta broth before draining; set aside. To the bacon and pancetta add the diced onions and minced garlic. Continue to cook 8 minutes. Stirring frequently. Stir in the white wine; scraping the bottom of the pan to incorporate all those lovely bits. 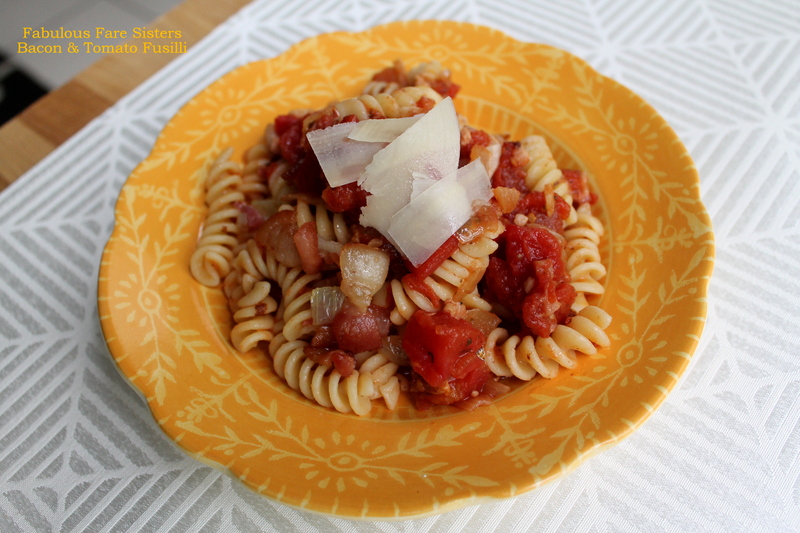 Pour in the diced tomatoes and the cup of pasta broth; stir to combine. Lower the temperature and simmer for a minimum of 10 minutes. Taste and adjust seasonings if necessary (salt, pepper, dried parsley, oregano & basil). If you use Basil & Garlic Seasoned Diced Tomatoes then additional seasonings may not be necessary. 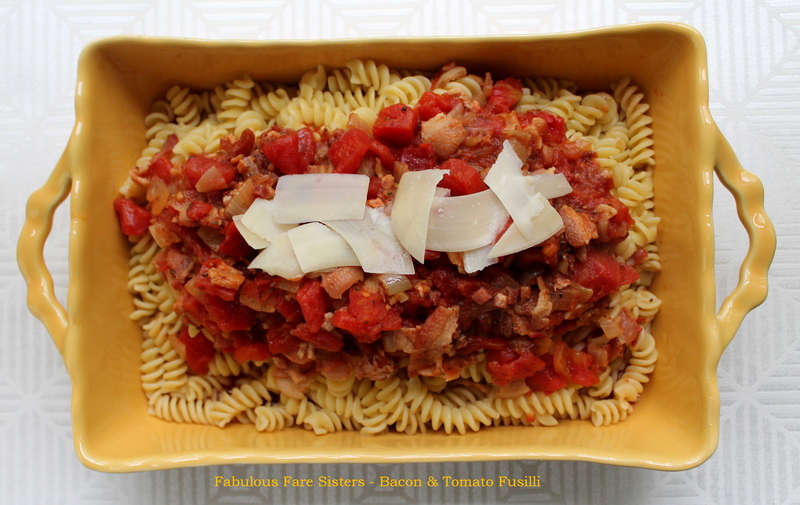 Scoop the Bacon & Tomato sauce over the hot Fusilli and sprinkle with fresh shaved Parmesan and serve. 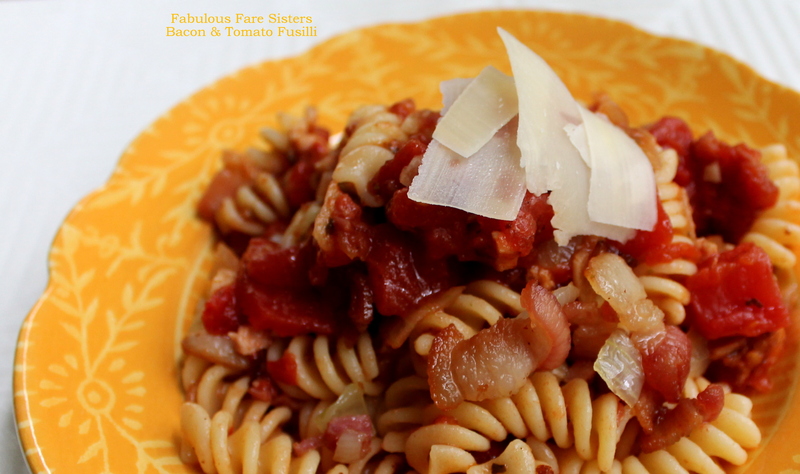 This recipe has been shared on What’s Cookin’ Wednesday, Senior Salon, The Pin Junkie, and Throwback Thursday along with Freedom Fridays, Foodie FriDIY, Fiesta Friday, Funtastic Friday, Saucy Saturdays and Weekend Potluck..go check it out and then go visit some other great sites! I always love to have a couple of easy good pasta recipes to pull out when time is short (or energy!) love all the bacon in this! Thanks for sharing with us at throwback thursday! This is comfort food at it’s finest! Love dishes like these. Not difficult but delicious! I love that you cook real food that I just know will be good. This is a great family-feeder. I recently tried a dark chocolate candy bar with bacon in it. It wasn’t bad, but I really couldn’t decide if the crunch part tasted like bacon or not… But looking at this one, I think the bacon will fully come across as… bacon. Thanks for sharing at Fiesta Friday! Mmm! Bacon AND pancetta, Linda?? You certainly gather my attention! Delicious!! AND… once again you got me at BACON! Lovely recipe Linda! This recipe sounds fabulous! Thanks so much for sharing at Inspiration Thursday! I like different pastas too. World Market has a unique selection. Why you gotta make so hungry?? looks so tempting! I did!!! All is right with the world!! YUM! Did you save me a seat?